To go along with the letter of the week, we have a memory verse that the boys work on each week. I’ve been printing out the verses, drawing a picture to go with it (the boys INSISTED that I draw a picture on the week that I didn’t feel like it), slipping it into a plastic cover, and hanging it on our calendar board. On Monday, the boys repeat the verse after Steve explains the meaning of it. Sometimes Steve comes up with fun activities to go with the verse – for example, he had the boys try to jump across a large gap to demonstrate “falling short” on week one. of the glory of God (pointing hands up to the sky). This technique works really well for both boys. Steven (5) has learned all the verses so far word for word, and even Matthew (3) has several of them memorized. Although he did say “glorious God” instead of “glory of God” for quite a while! Steven also gets a handwriting worksheet at some point that week that has all or part of the Bible verse. Most of the verses are drawn from the Sonlight Core A curriculum, but they don’t follow it completely. I included different verses for hard/soft consonants and short/long vowels, and sometimes I wanted to go more with a different Bible version. 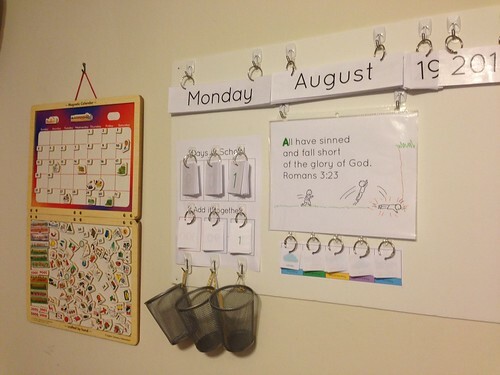 This entry was posted in Bible, Printables and tagged bible, k, pre-k, tot. Bookmark the permalink.